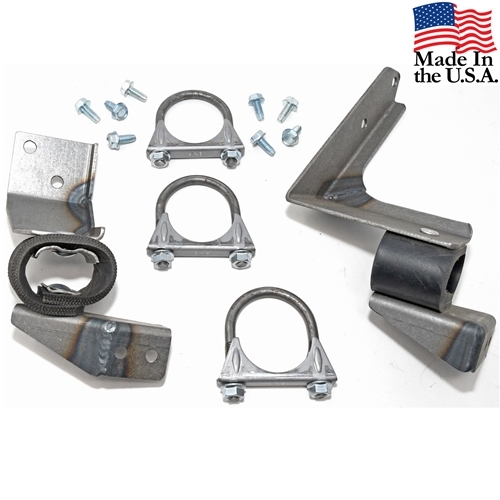 EXHAUST HANGER KIT FOR 67 SINGLE EXHAUST V8 (ALL) AND 6 CYL(AUTOMATIC TRANSMISSION) 2"
Hanger kit to install 67 Single Exhaust V8 (All) and 6cyl Automatic Transmission. Use with 2" Exhaust. Use with EH-622 and EH-621 systems. EXHAUST HANGER KIT FOR 67 SINGLE EXHAUST 6 CYLINDER MANUAL TRANSMISSION- 1 3/4"